Have you read Feed by Mira Grant? If not, then don't read this review 'cause there are some pretty big spoilers below and I'd hate to ruin it for you. In fact, if you haven't read Feed, go out and get a copy right now. It's great. Good world building, vivid characters, and an engrossing story. Total A read. What are you waiting for? Go! Go! Deadline picks up about two years after Feed. Shaun Mason is now head of the news blog, After the End Times, as the previous editor, his sister George, was murdered. George had been deliberately infected with Kellis-Amberlee, the virus that causes zombie-ism and Shaun was forced to shoot her dead. Something like that takes a toll on a guy. Since then, Shawn has been going through the motions, marking time, and acting a little crazy. He's bitter and angry and he spends most of his time talking to George. What makes this cuckoo bananas is that George talks back to him. Wherever Shaun goes, no matter what he is doing, there is a constant dialogue in his head between the two. It was heartbreaking to have George die at the end of Feed and I’m glad her presence is a part of Deadline – even if it is really just part of Shaun’s crazy. When a CDC researcher shows up at Shaun’s home in Oakland with news that George’s death may have been a smaller piece of a far greater conspiracy, Shaun is once again thrust into danger. Forced to go on the run, Shaun and the After the End Times crew race to uncover the truth behind the Kellis-Amberlee virus and bring vengeance to those responsible for George’s untimely death. Now, my limited experience with the zombie genre is that it is usually set at the beginning of an outbreak, with average folks battling the newly made zombie hordes in a graphic, bloody battle for survival. But the Newsflesh trilogy is set approximately 20 years after the initial pandemic, when society has reached a semblance of normalcy, albeit one that includes deadly zombies. No anarchist, lawless world here; society has adapted to the brain-eating menace. The rules have changed but there are still rules. I love the details of how society works in the Newsflesh world. This is a world were the most trusted names in news are all bloggers because the mainstream media dropped the ball during the initial zombie outbreak. Things that were normally taken for granted - like playing outside - are now no longer possible because you never know when a zombie will show up. Security measures are tight. A road trip involves multiple blood checks at each tollbooth, no building may be entered without a blood test, and cameras are everywhere. Society lives much of its life indoors and windows are not our friends. The details are just wonderful. As much as I enjoyed Deadline, it was a trifle overwritten, with things being explained numerous times when, really, once was enough. Shaun’s behavior was easily understood, so no clarification was necessary. We know that Shaun drinks coke now because George drank coke. Why keep mentioning it? Just have him drink the damn coke. You don't have to keep telling us why. We get it. We also hear again and again about Buffy’s betrayal. 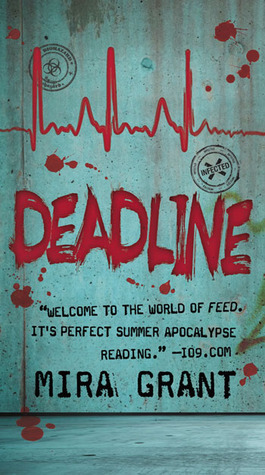 No one who has read Feed has forgotten it and those who have not, learn about it early on in Deadline. The constant reminder served no real purpose, especially when it continues to occur during the last quarter of the book. Yes. Yes. We know. Buffy betrayed you. But when I’m hurtling towards the climax at breakneck speed, I want to feel like I can't wait to turn the page. The reiteration slows me down, like a big Buffy speed bump. I’ve been going back and forth on whether to grade this book as an A- or a B+. I feel it is overwritten and so, not quite deserving of an A but I so thoroughly enjoyed it despite that. Deadline is a ramped up, action-adventure, conspiracy loving, thrill kill ride that is almost epic in scope. It’s such a fun read. I’d recommend this to anyone who has read Feed. If you haven’t, you could still read Deadline and follow the story but… it would be like skipping The Lord of the Rings and starting with The Two Towers. You could do it but why would you want to? I received a copy of Deadline for free at BEA 2011.